Microsoft has spent much of the last year updating Outlook.com into a better Gmail competitor, but much of those features have only been available for users who’ve signed up for preview access. 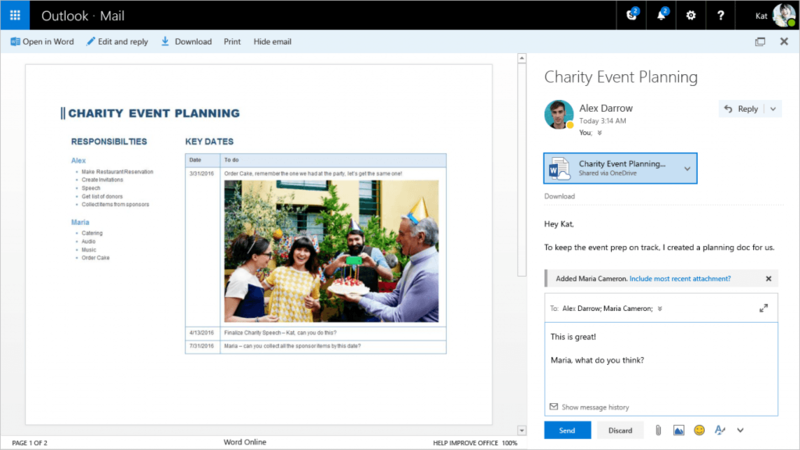 Fret no more, the new Outlook.com is rolling out to everyone. That means you’re getting a bunch of new features, especially if you hadn’t previously signed up for the preview. Two of the more interesting features, first announced in September, are the ability to ‘Like’ emails and use an ‘@’ to tag people in them. The former feature is useful for acknowledging when you’ve read an email without having to reply, while the latter is useful for directly referring to an individual person in a long email thread with many users. Not surprisingly, there’s expanded Skype support, which means you can chat and make both audio and video calls right from your inbox. Also very Microsoft-like is the ability to edit documents with full-fledged Office Online integration, including specific interfaces for Word, PowerPoint and Excel. Meanwhile Microsoft is making your email more fun with a variety of new emoji, image editing features and themes. Finally, Pins allow you to quickly find important emails, and search suggestions make it a bit easier to find the specific email you’re looking for. There are a lot of nifty third party plug-ins, too. For instance, Giphy integration means you can simply type search terms to find GIFs for specific situations or emotions. A Yelp feature helps you quickly embed restaurant and business recommendations – including reviews and contact information – while Wunderlist helps you quickly turn emailed requests into items for your to-do list. The roll-out timing is pretty ironic: Google just announced that you can now use Gmails best features and interface with non-google accounts, including @oulook.com. Hopefully Microsoft has added enough features to Outlook that users will want to stick with the native client.